Captain Hans Andersen has left Swindon Robins after two years on loan to join Elite League rivals Coventry Bees for the 2014 campaign. 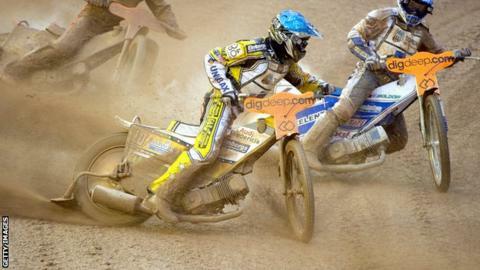 The Dane led the Robins to their first league title in 45 years in 2012, but was at the centre of a riders' protest over a unpaid wages last season. It will be the 33-year-old's third spell with the Bees. "Hans goes with our very best wishes and he goes down in history at this club," said team manager Alun Rossiter. "He led us to our first league title since 1967 and has been an integral part of our on-track success over the past two seasons." Andersen had been on loan at Blunsdon from Peterborough Panthers, who this week quit British speedway and were put up for sale. Coventry promoter Mick Horton added: "We went for a number one of the calibre of Hans because we want the best. "We feel that Hans is indeed one of the best, he's proved that in the averages, and this will send out a message that we are really serious about this team." Swindon's financial difficulties last season led the club to re-appoint Pete Toogood as promoter. The former Robins chairman replaced Gary Patchett who will take a step back from the day-to-day running of the club.